WeetHet - TiVo - What's in the box? Most residents of the USA are familiar with either TiVo or Replay. Basically it's a cool PVR (Personal Video Recorder) combined with a service (accessed by modem/phone) that helps customers to program their PVR to record TV-programs like movies, soaps, etc. 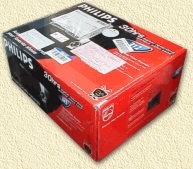 The PVR hardware (here I refer to the Philips TiVo) is basically a complete PowerPC running a specific Linux version. The hardware includes a harddisk, MPEG2-encoder and MPEG2-decoder. The MPEG2-decoder hardware is basically the same as used in a DVD player and DVB satellite reciever. Due to this hardware, the TiVo is capable of recording realtime MPEG2 to harddisk. I also have several ideas on how to expand the use of my TiVo, for example to hook it up to my home-LAN (Local Area Network) so I can copy MPEG2 recordings to my PC and store them on a CDR or CDRW. I actually have a load of other ideas, but let's just start at the beginning. So I ordered my TiVo at Tivo.com where the 30 Hours version. TiVo's can be found at eBay too! and one with two harddisks - that's the older model, which cannot be upgraded! By saying upgrade I mean to expand the recording capacity by adding an additional cheap IDE harddisk. A very long phone-cable and a phone-cable splitter for the hookup of the buildin TiVo modem (which is actually completely useless in this part of Europe since there is no TiVo service available yet - with the exception of the UK). 2 RCA cables are included for connecting Composite Video (Yellow) and Stereo Audio (Red = right channel and White = left channel). For European users: there are cables out there converting RCA to SCART. You might want to check, for example, Conrad for cheap cables. The TiVo also comes with a Super Video cable. This cable is prefered over the Composite Video cable (Yellow) mentioned above. Note that you will still need the Audio connectors (red and white) of the RCA cable mentioned above since the S-Video cable only passes Video on and no Audio! For European users: there are cables out there converting RCA to SCART. You might want to check, for example, Conrad for cheap cables. Note that not all TV/VCR sets support the use of S-Video! The difference is that composite video mixes the colors red, green, blue and the synchronisation signal to one single signal. S-Video keeps these signals apart giving you a better video quality. The SCART connector on your TV or VCR should support this too in order to get Video at all! The included IR (Infrared) cable is used to control other hardware - satellite reciever for example - via the TiVo. Newer models appear to have two infrared emitor, older models seem to have only one. Suggestions and info for additional uses of this cable are welcome, please e-mail me. This cable can be used to remotely control additional video hardware like a satellite reciever or can be used to access the TiVo shell by using a PC. For recieving TV-channels at all - unless you're using a satellite receiver that uses composite video or S-Video - we need to hookup cable/antenne as well using this cable. 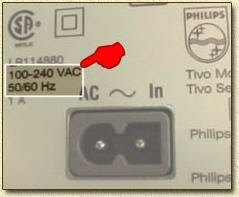 Most European users need to alter one of the connectors of this cable to get connected at all. This very common adapter is used for converting a 9 pin RS232 (as used on the "Serial Control Cable") to a 25 pin serial connector. Note: this is NOT a gender changer, nor a null-modem adapter! Naturally, a remote control including batteries is included too.